One of my absolute favorite tools as a physical therapist and mom is sidewalk chalk. I love sidewalk chalk because I can create fun gross motor themed activities by simply drawing on the sidewalk! Summer is the perfect time to get out that sidewalk chalk and give your kids a little challenge. Here are some of my favorite sidewalk chalk gross motor activities. The sky is really the limit when it comes to what you can do. 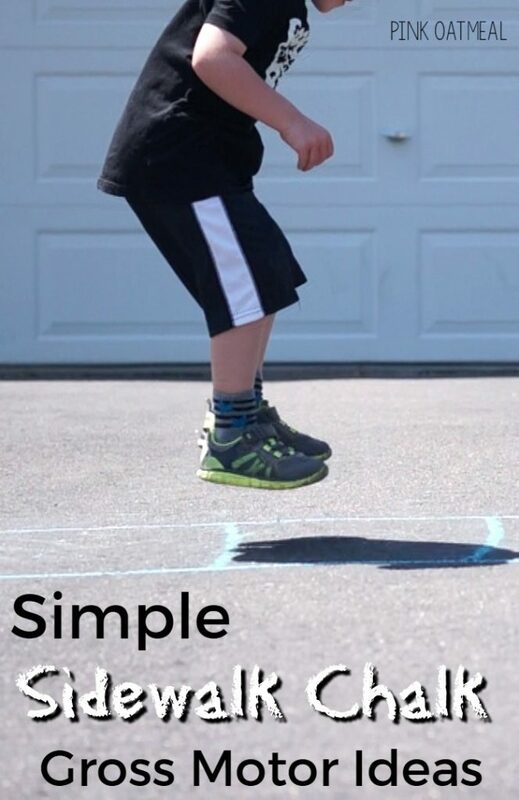 You can make really elaborate obstacle courses that kids need to move their bodies to get through to very simple sidewalk chalk gross motor activities in limited spaces. Agility Ladders – These tend to be one of my very favorite go-tos in small spaces. Simply draw a “ladder” on the sidewalk and encourage the kiddos to participate in different gross motor activities. Balance Beams – These can be as simple as a straight line to a really squiggly line. You can make them as wide as you want or as skinny as you would like. Spots or Lily Pads – I love to use these for jumping between different spots or stepping between different spots. Make them as wide apart or as close together as you need too. Make It Educational– Have kids jump to different shapes, numbers or colors. Depending on if the kids can read have the follow instructions on an obstacle course or add numbers together as they jump. Make A Highway – Use bikes, trikes or push toys to have the kids move around an obstacle course. Hopscotch – Good old school hopscotch is still a favorite way to use sidewalk chalk for gross motor activities. Combine several of these ideas to create fun obstacle courses depending on your child and your needs! My store at Pink Oatmeal is full of ideas to get the kids moving at home, in the classroom, and in therapy! There is everything from yoga, brain breaks, and movement games. Make movement a part of your day on a regular basis! Pink Oatmeal is here to help! If you prefer Teachers Pay Teachers you can find me there too! Let’s connect! Pink Oatmeal is on Facebook, Pinterest, Twitter, and Instagram! Come follow me!